The Crested Butte Titans soccer team’s winning streak came to an end, losing to Telluride 2-1 on Thursday, October 22. 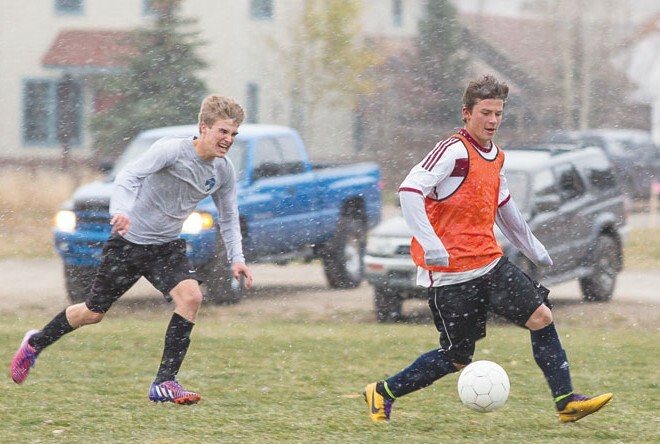 It was a tough way to end league play but the Titans now have their sights set on an even bigger challenge as they face Vail Mountain in the first round of the state tournament on Friday, October 30. 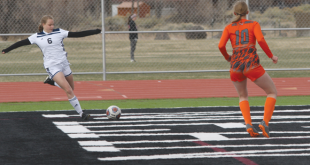 The Telluride Miners came into the game on fire with a record of 8-2-1 and opened the first half of the contest in complete control of the pace and possession. Heavy pressure on the Titans’ midfield forced several turnovers in the Titans’ half of the field and the Miners switched immediately into attack on the Titans’ net. Despite playing in their own half for the first 30 minutes of the game, the Titans held off the Miner attack with keeper Josh Pruett standing on his head in net, Alden Watkins, Woody Martineau and Thomas Taaca shutting down the middle of the field and Nate Hoskin and Dylan Eaton solid on the outside. The Titans turned things around for the final 10 minutes of the first half with Oliver Houseman and Jordi Nichols providing some attack on offense and Cam Curtiss and Gus Hensley opening things up on the flanks, but the Miners proved too quick on defense to leave any openings for the Titan attack and the two teams closed the first half scoreless. Some tweaks to the Titans’ mentality at halftime provided a more balanced game in the second half. Pruett continued his heroics in net and Justin Smith stepped on to the field to help create better transition from defense to offense with Patrick Seifert, but the Miners’ hustle created a chance on goal and they converted for a 1-0 lead 15 minutes into the second half. The Titans were handed a blow when Taaca had to leave the game with an injury and Noah Dumas moved from center midfield to center back for the remainder of the game. Dumas was masterful in his duties directing the Titans defense, but the Miners doubled their lead on a set play from 25 yards out 10 minutes later. Crested Butte remained committed to closing the game out strong and started finding seams in the Miners defense. Heavy pressure resulted in a set play chance for Crested Butte with 10 minutes remaining and they converted. As the Miners packed in front of their net, Smith slipped a pass to Watkins at the top of the 18 and Watkins drove his shot low and hard through traffic, past the Miner keeper, to pull within one. The Titans continued to press but they struggled to find the final touch for the game-tying goal, ultimately falling 2-1 to Telluride. “We definitely played a much more evenly paced game,” says Davis. “We just couldn’t quite muster up that tying goal even though we were surging. Overall I think we played a quality game of soccer,” Davis continued. The season is far from over for the Titans though. 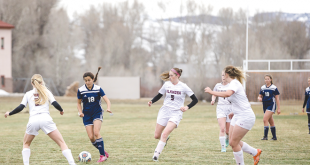 Their late season rally winning three of the last four games earned Crested Butte a spot in the 3A state tournament. The tournament seedings were announced Sunday evening and the Titans will have their hands full as they are seeded 29th and must face state powerhouse and fourth seeded Vail Mountain School on Friday, October 30 in Vail. If the Titans pull off what would be a massive upset, they will remain in Vail for the second round of the state tournament on Saturday, October 31.